Last night Te Ara won a prize at Ngā Kupu Ora Māori Book Awards, which are organised by Te Pūtahi-a-Toi at Massey University. Te Ara (part of Manatū Taonga – Ministry for Culture and Heritage) won the non-fiction category for our book Te taiao – Māori and the natural world, published by David Bateman last year. The book itself was the product of a number of entries written for various themes. The book is structured around Māori conceptions of the natural world – for example Ranginui for the sky and Papatūānuku for the earth. An assortment of writers, editors, resource researchers and copyright staff, along with the publishers, all worked to put the book together. By the multitudes the work will be accomplished. Myself and Jock Phillips, Te Ara’s senior editor, spoke at the awards. Jock made the point that in many ways the ceremony was a homecoming for Te Ara. He noted that Professor Sir Mason Durie had organised at hui at Te Pūtahi-a-Toi in 2001 to give advice on how to formulate Māori content for Te Ara. One of the results was Te Ara Wānanga, Te Ara’s Māori Advisory Committee. Professor Durie was one of the founding members of the committee. Also pleasing was the award for biography, which went to Joseph Pere for his work on his grandfather, Wiremu Pere: Wiremu Pere: the life and times of a Maori Leader, 1837–1915. Joseph Pere is a former recipient of the Māori History Fellowship at Manatū Taonga. Other recipients were Robert Jahnke for Tirohanga o mua: looking back, Tina Makereti for Once upon a time in Aotearoa, Chris Winitana for Tōku reo, tōku ohooho, and a special award to Derek Fox for Mana magazine. Nā reira he mihi nui tēnei ki ngā kaiwhakawhiwhi, i riro i a koutou tēnei honore. He mihi hoki ki Te Pūtahi-a-Toi, heoi anō ki Te Kunenga ki Pūrehuroa mō tēnei kaupapa nunui. The theme of Māori Language Week this year is ‘Manaakitanga’. At Te Ara we decided that one way we could ‘Manaaki’ others was by making our great Māori language resources from Dictionary of New Zealand Biography (DNZB) available as an e-book, and so we have published all the biographies of renowned Māori in te reo Māori. This new e-book can be downloaded from: http://www.mch.govt.nz/news-events/news/ng%C4%81-t%C4%81ngata-taumata-rau-1869-1960. The publication, Ngā Tāngata Taumata Rau, 1879-1960, comprises close to 500 biographies, all in Māori. For a reader of Māori the content is a joy to read due to the excellence of the translators involved, including Tairongo Amoamo, Te Pōroa Malcolm, Pou Temara, Merimeri Penfold, Wiremu Kaa, and Rangi McGarvey. We have been fortunate at Te Ara to have Rangi McGarvey continue on as a Māori language expert with oversight of our Māori-language content. As the proverb goes, Nāu te rourou, nāku te rourou, ka ora ai te iwi – With your basket and my basket, the people will prosper. Members of design team, Julia Vodanovich and Heath Sadlier, designed the cover, which evokes the original covers. The most important role was played by our resident tech wizard, David Turton, who was able to download all the files from our database to be transferred to the e-book. For me this project was a great way to kick off my new position as director, Māori digital projects. I’ve already got Ngā Tāngata Taumata Rau, 1769-1960 on my Kindle and plan to read one biography a day until I’ve gone through the lot (which should take about a year and a half). The other thing worth observing is that this format provides a great opportunity for our rangatahi (youth) to access te reo content. Increasingly the current generation, which has been described as ‘net natives’ due to the fact that they have grown up surrounded by technology, access content through portable devices the majority of which have some form of e-reader. So it’s an ideal platform to look to develop our te reo content on. Hopefully this will be the first of many. Ko manaakitanga te kaupapa o te Wiki o te Reo Māori i te tau nei. I tipu ake te whakaaro ko te huarahi tika ki te manaaki i te reo ko te whakaputa i tetahi pukapuka hiko; ko Ngā Tāngata Taumata Rau te kaupapa. Nā reira, i tāngia e Te Ara, ngā haurongo Māori i roto i te reo Māori: http://www.mch.govt.nz/news-events/news/ng%C4%81-t%C4%81ngata-taumata-rau-1869-1960. Ko Ngā Tāngata Taumata Rau, 1879-1960 te hua i puta mai, ā, kua tata te 500 ngā haurongo kei roto. Ka mutu pea te reo i roto. Ko ētahi o ngā tohunga nā rātou ngā kupu i whakairo ko Tairongo Amoamo rātou ko Te Pōroa Malcolm, ko Pou Temara, ko Merimeri Penfold, ko Wiremu Kaa, ko Rangi McGarvey. Waimarie mātou o Te Ara, ko Rangi McGarvey tō mātou whakaruruhau mō te reo i runga i Te Ara. E pēnei ana te whakataukī, Nāu te rourou, nāku te rourou, ka ora ai te iwi. Ko Julia Vodanovich rāua ko Heath Sadlier ngā kaihanga whakaahua i whakarite i te uhi o te pukapuka. Nā tō mātou tohunga rorohiko i tuku mai i ngā kupu katoa mō te pukapuka. Ki a au nei, he kaupapa pai tēnei hei timata i taku tūranga hou, kaiwhakahaere mō ngā kaupapa hiko. Kei runga Ngā Tāngata Taumata Rau, 1769-1960 i taku Kindle i tēnei wā, ā, hei te mutunga o tērā tau kua pānuitia katoatia te pukapuka e au. Ka pānuitia e au tētahi haurongo ia rā. E kore e pau he ika unahi nui eee hai! Aue, taukuri e! Ehara i te aurukowhao, he takerehaia! E rere rā te motu nei ki roto koia o Parihaka! It is with great sadness that I heard Te Miringa Hohaia had passed away. Te Miringa has had a long association with Te Ara. In our first theme, New Zealand Peoples, we were honoured to have Te Miringa write the Taranaki tribe entry. More recently, a small group from Te Ara travelled to Taranaki to launch the Taranaki regional entry. Te Miringa graciously welcomed us during the whakatau at New Plymouth. He was a humble man who worked tirelessly for his iwi and will be missed. This year’s Te Wiki o te Reo Māori (Māori Language Week) has the theme, Te Mahi Kai, The Language of Food. To get you started, here are some kai-related terms: kūmara, rua kūmara, pātaka, whata, kurī, kiore, pūhā, poaka, wīti, rīwai, kāpia, ipu and kōhatu. Though Māori ancestors came from Polynesia, one of the plants they brought with them, kūmara (sweet potatoes), originated from South America. The kūmara we eat today is different from kūmara eaten in pre-European times. It was imported in the 19th century. Māori stored kūmara in elaborate sealed pits located in the ground known as rua kūmara. Other food was stored in pātaka (carved storehouses), or on whata (elevated stages). Kurī (Polynesian dogs) and kiore (Pacific rats) were delicacies. Along with birds, kurī and kiore were potted in their own fat and considered a luxury item in pre-European times. 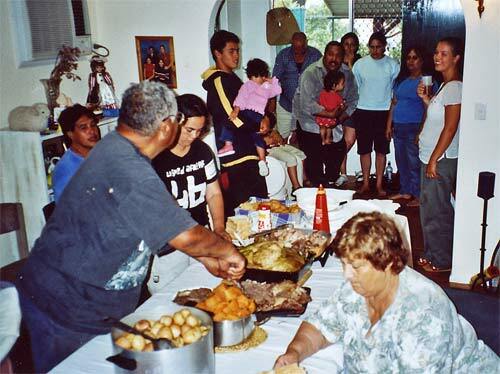 Pūhā and porkbones are a classic Māori meal. However, while pūhā is native to New Zealand, poaka (pigs) were only introduced to New Zealand from the late 1700s. Māori bread and rīwai (Māori potatoes) are also post-European developments as wīti (wheat) and potatoes are European introductions. The gum from the kauri tree was known as kāpia. It was used as chewing gum. Drinks were warmed by being placed in a ipu (container) and having kōhatu (heated rocks) placed into the container.